Monthly data released last week included a paltry nominal increase in retail sales, an actual slight decrease in industrial production (but with prior months revised substantially higher), and a surprising increase in consumer confidence. There was a surprise surplus in the Treasury budget in January. $130.0 B (adjusted -13.1% for 2013 payroll tax withholding changes) vs. $143.2 B, -6.2% YoY last 20 days. The unadjusted result was $149.6 B for a 4.5% increase. Employment metrics were contradictory this week. Initial claims appears finally to have established a new lower range of between 330,000 to 375,000. The ASA is running even with 2007, and slightly ahead of last year, although the absolute index was higher. Let me repeat my comment on tax withholding from last week: I am adjusting my YoY tax withholding figures to reflect the increase in personal withholding taxes. While the YoY collections are up substantially, they should be up over 15% to compensate for the tax increase. Since I can think of no reason why employment itself should have fallen off a cliff in January, it is very possible that there is a lag in the payment of withholding taxes with the new increase. If this hypothesis is correct, I would expect tax withholding to be much more reliable by the end of February. So far, that isn't happening. Gallup daily consumer spending 14 day average at $86 up $26 YoY ! Gallup has been outrageously positive for nearly 3 months. The ICSC varied between +1.5% and +4.5% YoY in 2012. This week was again close to the bottom end of that range. Johnson Redbook is also in the lower part of its YoY growth range from 2012. Even in the worst case, it still looks like consumer spending has not collapsed due to the tax withholding increase. It's worth noting that WalMart is not included in either ICSC or Johnson Redbook. Housing prices bottomed at the end of November 2011 on Housing Tracker, and have averaged an increase of +2.0% to +2.5% YoY for the last year. This week was the best YoY comparison in about 7 years. Loans turned up at the end of 2011 and averaged about 1% gains YoY through most of 2012, and have recently shown somewhat more YoY strength. This week was close to the bottom of its recent YoY range. 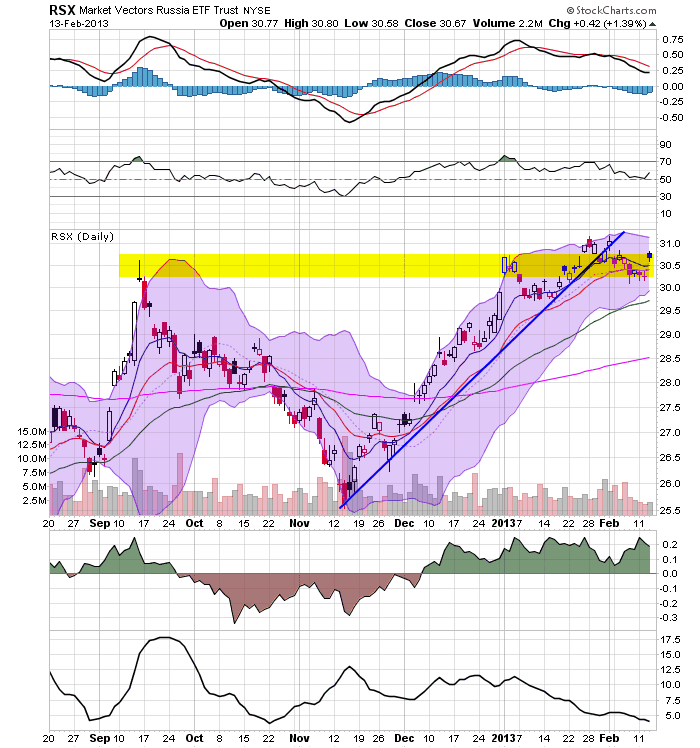 Purchase applications had been going sideways for 2 years,, but in recent weeks may have finally broken out of that range to the upside, but the move is not decisive yet. Refinancing applications were very high for most of last year with record low mortgage rates, but these have recently increased. Interest rates for corporate bonds have generally been falling since being just above 6% two years ago in January 2011, hitting a low of 4.46% in November 2012. Treasuries have fallen from about 2% in late 2011 to a low of 1.47% in July 2012. Spreads have varied between a high over 3.4% in June 2011 to a low under 2.75% in October 2012. The last few weeks have seen a marked increase in rates, although the YoY changes remain positive. Gas prices are increasing seasonally. Unusually for the last year plus, the 4 week average for the third week in a row was positive YoY. This may be due to winter weather being, well, actually winter-like this year. The AAR changed its carload categories this week, so no week over week diffusion index is possible. It should be able to be resumed next week comparing the new categories. Rail transport had been whipsawing between very positive and very negative readings over the last 2 months. This may well be the aftermath of the dock strikes. Traffic ex-coal has now returned to being positive for the second week in a row. The Harpex index is gradually improving off its 3 year low of 352, and the Baltic Dry Index is also slowly improving from its recent low. The TED spread made a new 18 month low. LIBOR remained at its new 52 week low and is close to a 3 year low. There are a few inescapable "blind spots" in these high-frequency indicators. There is no weekly gauge of manufacturing, nor of trucking, for example. It's fair to say that the weekly consumer sales information is very much different from the email leaked from WalMart yesterday. WalMart dropped out of the ICSC measure several years ago, and as it dominates low end retail, both the ICSC and Johnson Redbook may have a bias towards mid to higher end retail sales. On the other hand, Gallup's self-reporting by consumers should be unaffected. It remains the case that the most important issue at the moment is whether the 2% increase in withholding tax rates is having an effect on consumers. The impending austerity of the budget sequestration is an additional negative, and it looks very likely at this point. The potential consequences of moving income and spending forward into 2012 from 2013 due to tax increases are also noteworthy. For the last three weeks it looks like we got some - but by no means an overwhelming amount of - evidence that there has been an effect. By far the most negative data was tax withholdings. Temporary jobs aren't negative, but they are flat. M2 money supply has declined since the first of the year. Corporate bond rates are rising and the credit spread is widening, although it is still closer to YoY lows. Continuing positives once again include the housing market, consumer spending especially as measured by Gallup, bank lending rates, and commodity prices. Gas prices, while rising, haven't turned constrictive yet. Gas usage has turned positive. Rail traffic is also positive again. Jobless claims appear to have established a new, lower range. As I said last week, while there is some evidence of a consumer and employment slowdown, the majority of the high frequency data continues to support economic expansion. Let's finish our look at the four largest economies in the EU by analyzing Spain, the fourth largest economy in the region. 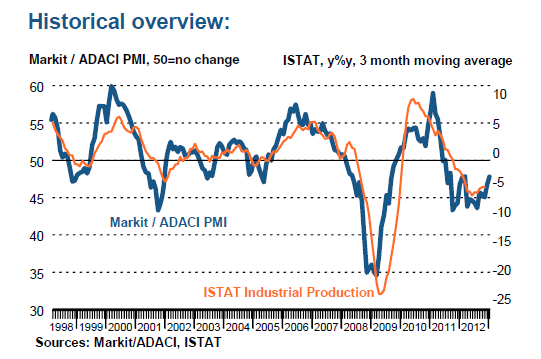 The Spanish manufacturing sector remained in contraction at the start of 2013. Solid declines in both output and new orders were recorded again, and firms continued to cut jobs. There was, however, some positive news on the export front as new business from abroad rose for the third time in the past four months. The seasonally adjusted Markit Purchasing Managers’ Index® (PMI®) – a composite indicator designed to measure the performance of the manufacturing economy – posted 46.1 in January, up from 44.6 in the previous month. Although the latest reading signalled the weakest worsening of business conditions in 19 months, it was still solid. 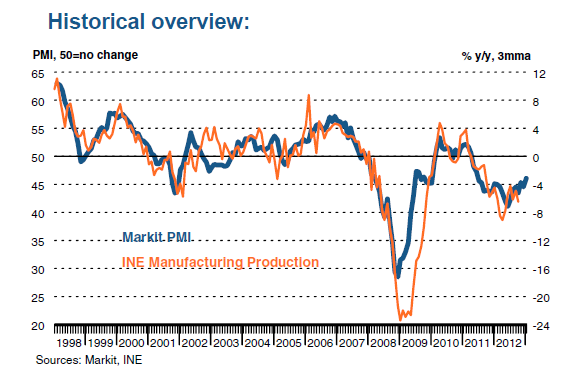 Spanish manufacturing production decreased for the twenty-first consecutive month in January, and at a marked pace. Respondents linked falling output to lower new business. Total new orders continued to contract at a solid pace, although the rate of decline eased to the weakest since June 2011 as a result of increased new export orders. New business from abroad rose for the third time in the past four months, and at a broadly similar pace to that seen in December. 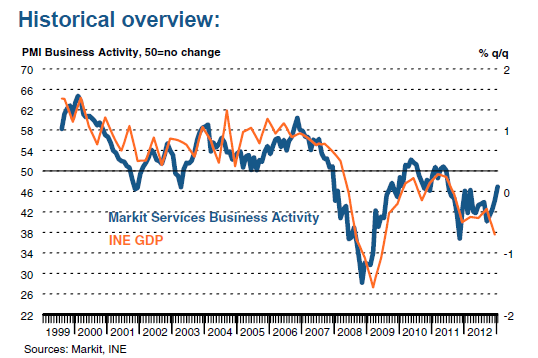 Although the Spanish service sector remained in contraction at the start of 2013, both activity and new business declined at slower rates during the month and confidence among firms with regards to the 12-month outlook improved. That said, employment continued to fall during January, and at an accelerated pace. The headline seasonally adjusted Business Activity Index – which is based on a single question asking respondents to report on the actual change in business activity at their companies compared to one month ago – rose to 47.0 in January, from 44.3 in the previous month. The latest reading signalled a further solid reduction in activity during the month, although the rate of contraction was the weakest in the current 19-month sequence of decline. Those respondents that posted a decrease in activity linked this to falling sales amid the economic crisis in Spain. New orders decreased at a solid pace in January, although the rate of decline eased to the slowest since August 2011. Financial Intermediation posted growth of both activity and new business, while the remaining monitored sectors all recorded declines. There is nothing positive in the manufacturing report. The index itself is at very low level -- despite its recent upturn. New orders and overall production decreased at a "marked" pace. While new orders from abroad did increase, these are still at low levels. The only good news is the lack of inflation, which is to be expected. The service sector at least is seeing a pick-up as evidenced by the sharp jump in the overall index (lower chart). The overall index and production decreased at a solid pace. 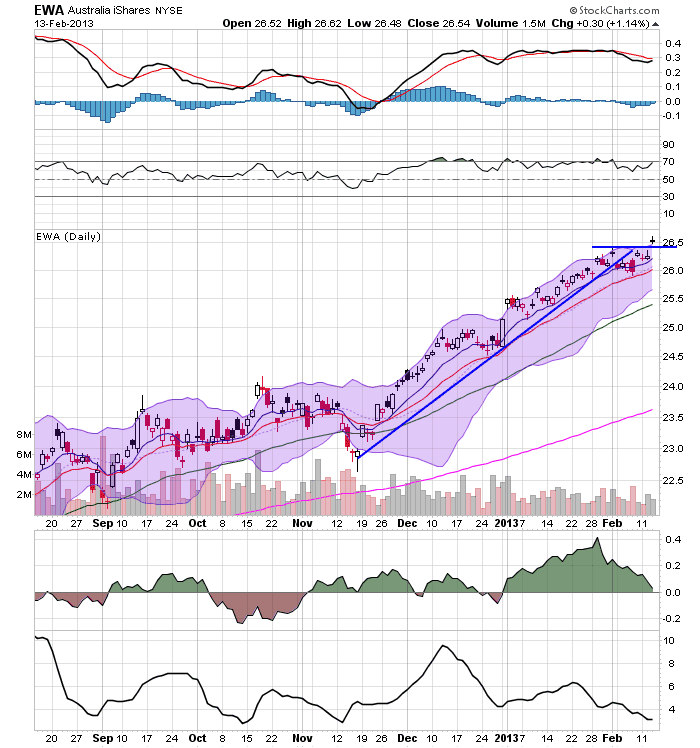 The only good news is that financial intermediation increased, signaling that the banking sector may be healing a bit. The combined impression both reports give is of an economy still deep in a recession. The top chart shows that Spanish GDP has been contracting for 5 quarters -- clearly a recession. 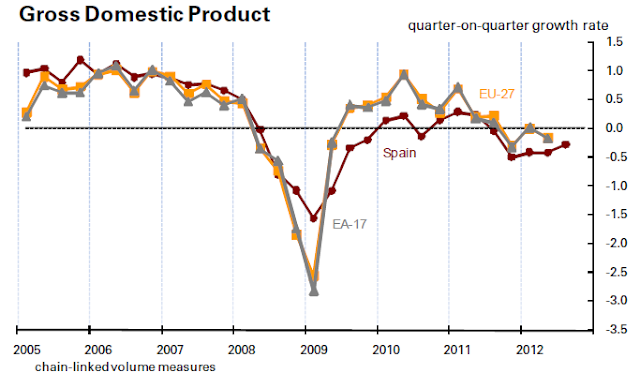 The lower chart shows the Q/Q growth rates of Spanish GDP and its various components. The key issue here is the incredibly large number of negative numbers across all categories and all time frames. Put another way, you'd be hard pressed to find any good news in this chart; its simply does not exist. November was originally reported at 97.8. It is now 98.3. December was originally reported up 0.3 to 98.1. It is now shown as up 0.4 to 98.7. So the -0.1 decline to 98.6 reported this morning is actually 0.3 better than the expected 98.3. While this adds to concern that the economy is just shambling along and that the payroll tax increase and the looming sequester may be enough to derail the expansion, the revisions pretty much dispose of the claims of those who said that a recession began last July, when the industrial production index was at 97.9. I'm looking at you, Lakshman Achuthan. Italy is the third largest EU economy, accounting for almost 17% of total EU GDP. headline number was a much slower drop in output than seen in December. The latest decline in production levels was only modest, and the least marked over the current spell of contraction that began in October 2011. Data also pointed to an improved trend in new orders placed at Italian manufacturers, which fell at the slowest rate for ten months in January (although still solidly in the context of historical data). That was in part a reflection of a return to growth in new export business, although the rise was only slight. Despite recording slower declines in both production and new orders, Italian manufacturers cut staffing numbers at a solid and slightly accelerated rate during January. That extended the ongoing spell of net job losses in the sector to a year-and-a-half. Anecdotal evidence highlighted the non-replacement of voluntary leavers as a key reason for falling employment. January saw Italy’s service sector output contract at a faster rate, as highlighted by the seasonally adjusted Markit/ADACI Business Activity Index – which is based on a single question asking respondents to report on the actual change in business activity at their companies compared to one month ago – falling from December’s post of 45.6 to 43.9 in the first survey period of the year. This latest reading was the lowest since last July, and signalled that the sector’s ongoing sequence of contraction extended into a twentieth straight month. Reflecting the sustained (and accelerated) decrease in business activity, Italian service providers continued to slash staff numbers during January. Moreover, the decline in employment over the month was the most marked since data collection commenced over 15 years ago. Behind the weakness in the sector was a further drop in the level of incoming new business, which panel members suggested was in part due to a loss of clients since December. Although slower than in the final two months of 2012, the rate of decline in new work was nevertheless still sharp in the context of historical data. The news here is split. Manufacturing is getting better -- although still printing the negative range -- while services are contracting at a sharper rate. Also note that while manufacturing is healing -- as shown by the improvement in new export orders -- manufacturing employment is still dropping as a result of excess capacity. We'll need a few more months of good data for that trend to change. Italy has had four quarters in a row of GDP contraction, indicating the economy is in a recession. Unemployment has printed at 11.2% for the last four readings. While there are indications from the manufacturing report that the recession is moderating, the overall PMI is still printing negative. Services are not in good shape and the economy is still in a technical recession with high unemployment. I'm not sold on the idea of Italy coming out of the recession just yet. 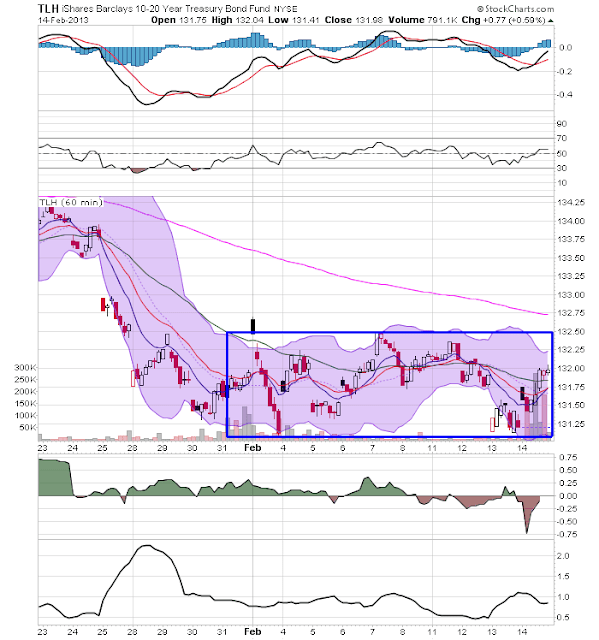 Very briefly, yesterday's price action rallied the long end of the treasury curve about 1%. However, all this did was to rally prices within a consolidation range. 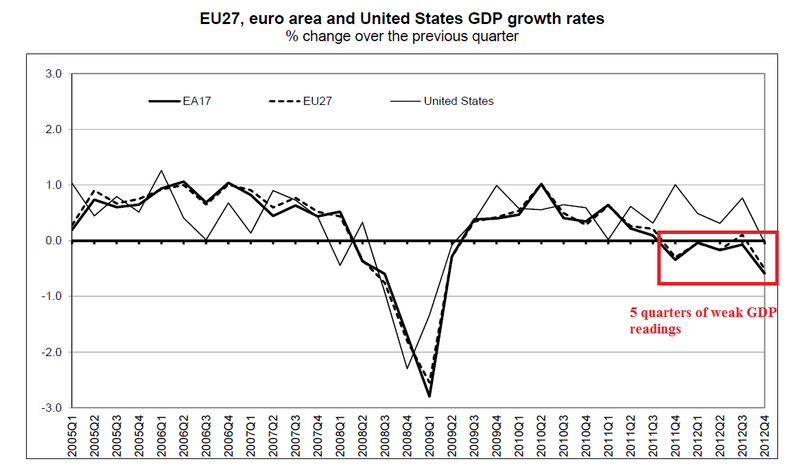 We saw a general sell-off in Europe as a result of the GDP data. Finally, gold is still trading in a range, telling us that uncertainty and/or fear of instability isn't spiking. Yesterday, the long end of the treasury curve rallied strongly in reaction to the poor GDP showing from the EU. 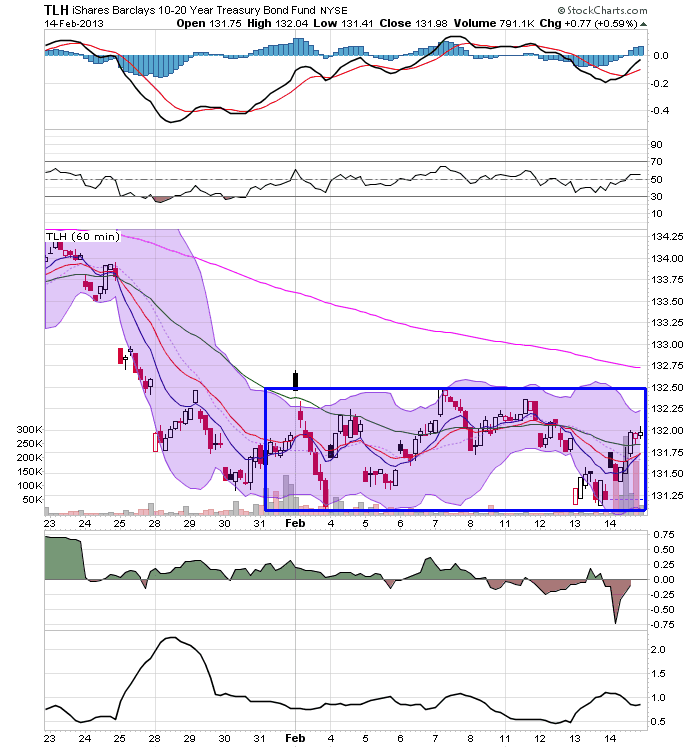 Te above 60 minute charts of the TLH (top chart) and TLT (bottom chart) show that both ETFs have been trading in a range for the entire month of February. Yesterdays gain -- while strong -- wasn't strong enough to break this consolidation. 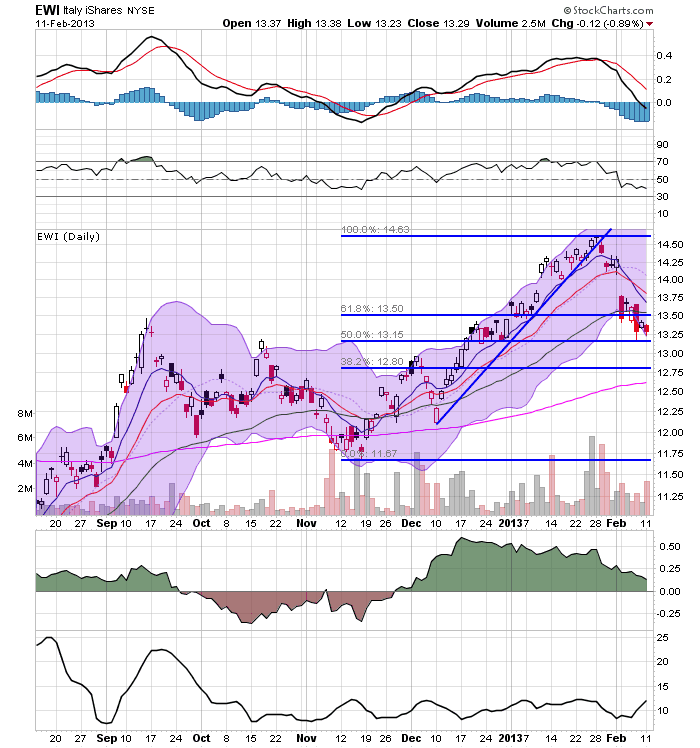 The French market -- whose underlying GDP was poor in the latest EU GDP report -- has fallen below the top Fib fan. Now the 50 day EMA is the most likely level of support. 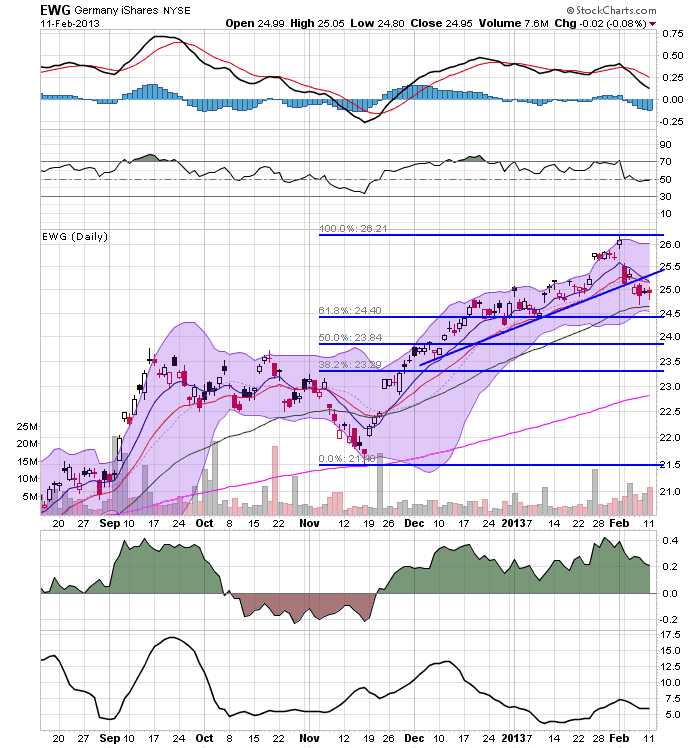 This would also put this ETF right about the 61.8% Fib level. 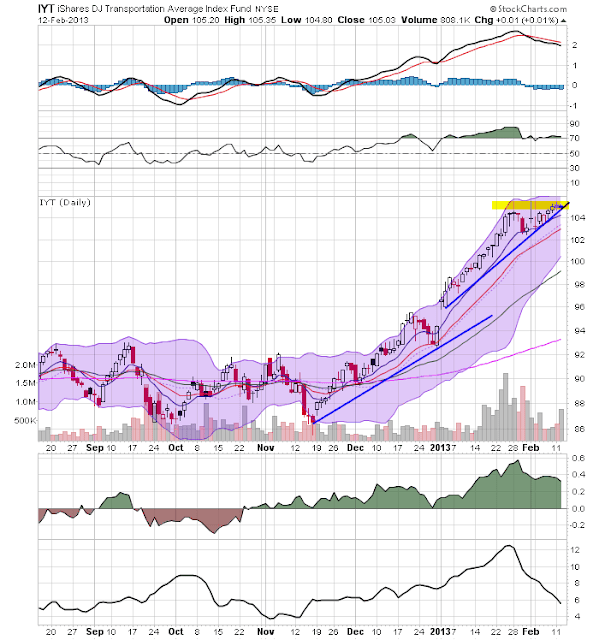 I've included the Italian (top chart) and Spanish market (bottom chart) to show that yesterday's EU GDP news hit the entire region's ETFs. The gold ETF continues to trade between the 150 and 175 level. This tells us that investors and traders don't see inflation around the corner. You could also argue that gold is a hedge against uncertainty, so the drop since the end of last summer indicates that traders are less concerned about uncertainty. 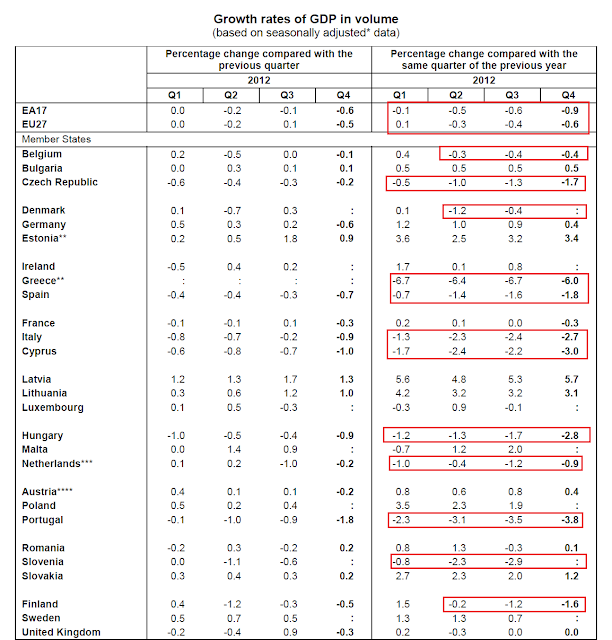 I wrote this before today's release of the EU's GDP report. Suffice it to day, France did not bode well in that release, either. 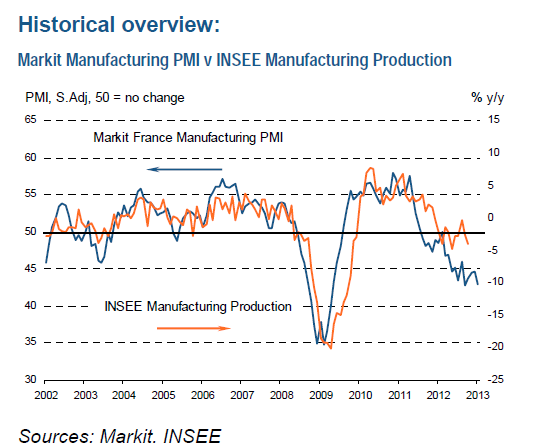 Operating conditions in the French manufacturing sector worsened during January. The headline Purchasing Managers’ Index® (PMI®) – a seasonally adjusted index designed to measure the performance of the manufacturing economy – dropped from 44.6 in December to 42.9, its lowest reading in four months. The PMI was dragged lower by all five of its components; output, new orders, employment and stocks of purchases all contracted at accelerated rates while suppliers’ delivery times lengthened to a less marked degree than one month previously. Key to the weaker performance of the manufacturing sector was a steep decrease in the level of new orders placed with French manufacturers. The rate of decline in new work was the fastest since March 2009. Panellists commented that heightened economic uncertainty had resulted in a tough business climate during the latest survey period. Data signalled that domestic demand was again the key source of weakness, as total new orders fell at a considerably sharper rate than export sales. The seasonally adjusted final Markit France Services Business Activity Index – which is based on a single question asking respondents to report on the actual change in business activity at their companies compared with one month ago – slipped to 43.6 in January from 45.2 in December. The latest reading was indicative of a marked rate of contraction that was the sharpest for almost four years. Panellists attributed lower output to difficult economic conditions and declining levels of new business. Business activity across the French private sector as a whole decreased at a steep rate in January. 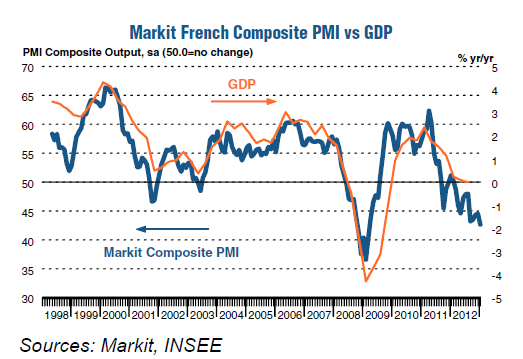 At 42.7, down from 44.6 in December, the seasonally adjusted final Markit France Composite Output Index – which covers the combined manufacturing and service sectors – signalled the steepest rate of decline since March 2009. Neither of the respective reports or charts have any good economic news. The French manufacturing sector (top chart) has been declining for the better part of a year, bringing down overall GDP growth. As the accompanying write-up demonstrates, the slowdown is broad-based, hitting all five components of the index. Most importantly, the real issue is the domestic slowdown caused by slowing growth and overall uncertainty. The service sector chart (bottom chart) has the exact same problem as the manufacturing chart -- an overall rate of decline for the better part of the last year. 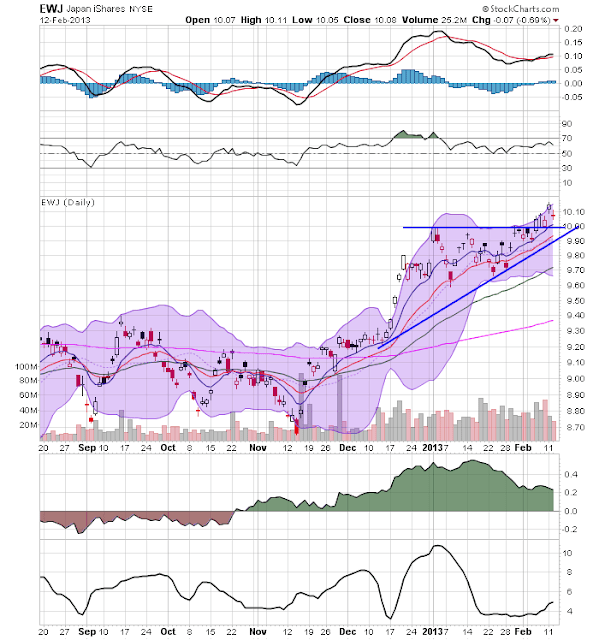 Also note there is not upward trend in either chart. The above chart shows overall French GDP growth along with the percentage contribution from various parts of GDP. 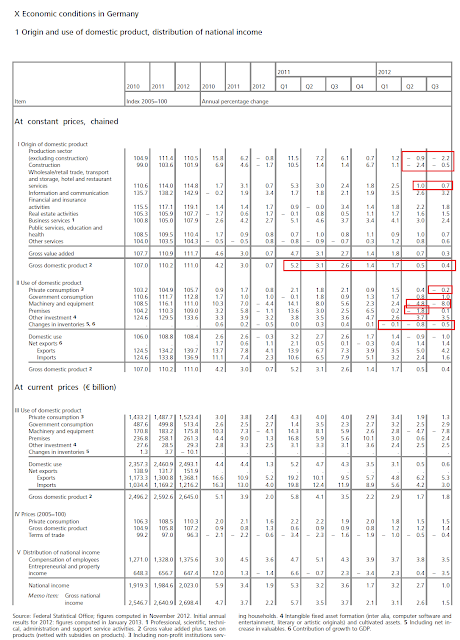 Pay particular attention to the line that shows overall growth. In 2010 and the 1Q11 we see strong growth. 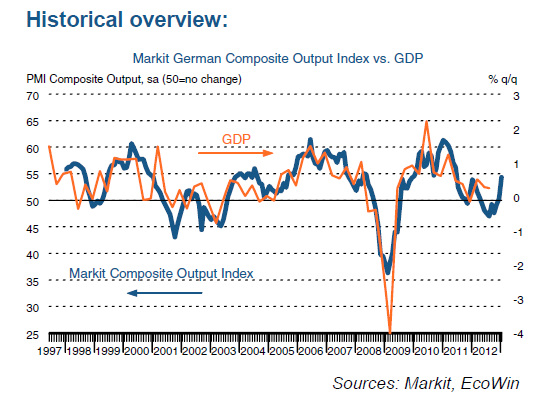 However, since then overall growth has stalled, printing either slightly positive or slightly negative. 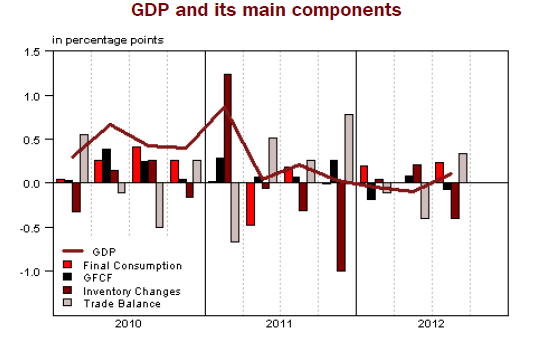 The above chart puts the GDP data into clearer view. First, the overall growth rate at the macro level has stalled right around 0% for four quarters. While that's not a technical recession, it certainly is not the sign of an economy that is doing well. The underlying data shows that a variety of factors have contributed to the overall growth slowdown over the last four quarters. Inventory adjustments slowed the economy in 4Q11 and 2Q12. The first quarter of 2012 saw a big hit to net investment, while foreign trade slowed the economy for two quarters. The above data shows no promise for the French economy going forward. Instead, we see an economy struggling to print positive growth. The top graphs shows that on a quarter to quarter basis, the region has been performing poorly for the last five quarters. The graph above shows that 9 countries have been contracting on a percentage change from the preceding year and three additional countries have been contracting for three quarters on the same basis. There is nothing good in these numbers. This morning the Labor Department reported initial jobless claims fell to 341,000. The 4 week moving average rose slightly to 352,500. Any given weekly report can be noise, and must be taken with several grains of salt. This one, however, is particularly encouraging. Up until 4 months ago, there had not been any post-recession report below 350,000. But in the last 10 weeks, 4 of the reports have come in under 350,000, with a new post-recession low of 330,000. When we got the very good reports in January, there were warnings that they were post-Christmas distortions. The same cannot be said of this week's number. 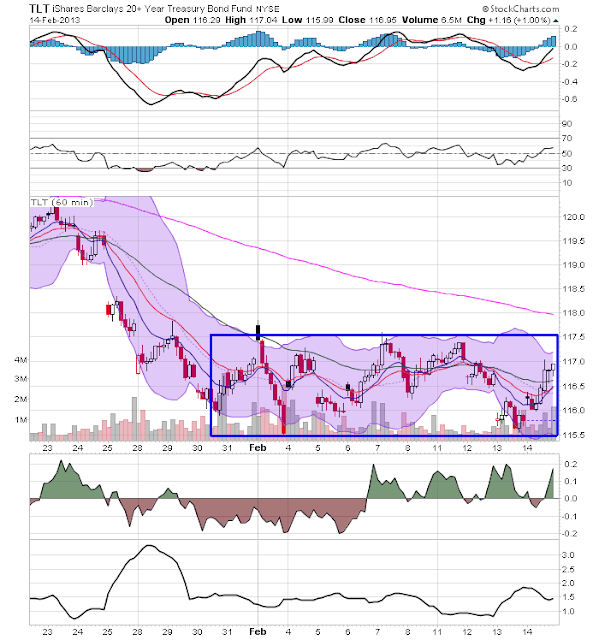 The 60 minute SPU chart (top chart) shows that prices consolidated at the beginning of the month (Feb. 108), then broke through topside resistance on Feb. 9. Prices rallied a bit from there but then sold-off a bit. 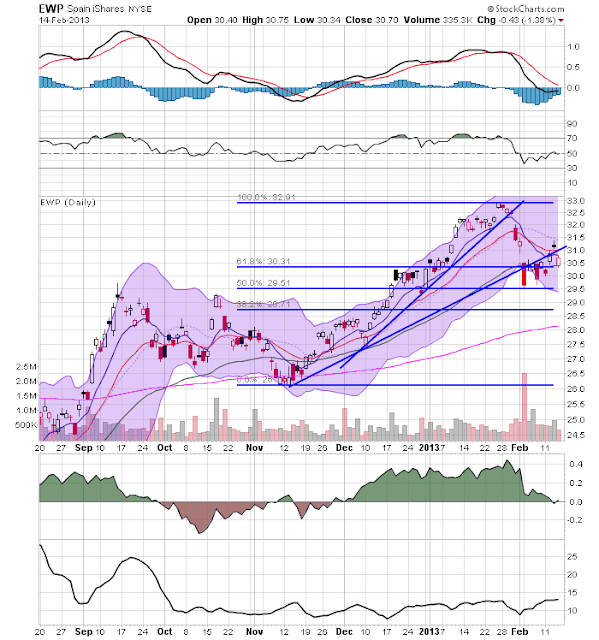 The 151 price level provides near-term support. The daily chart (lower chart) shows the uptrend is still intact. Prices are using the EMAs for technical support and all EMAs are still moving higher. 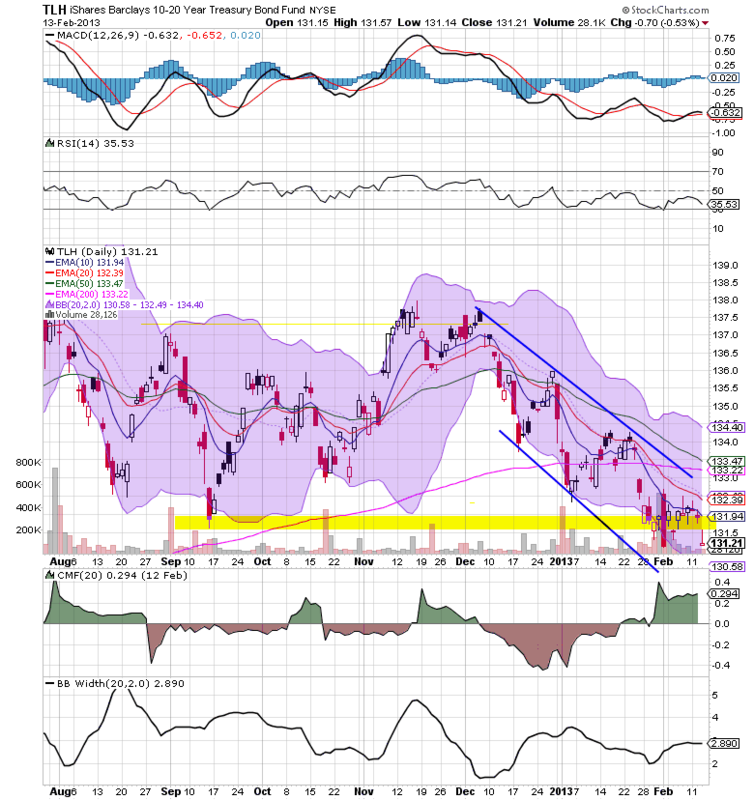 However, the MACD is now drifting lower. 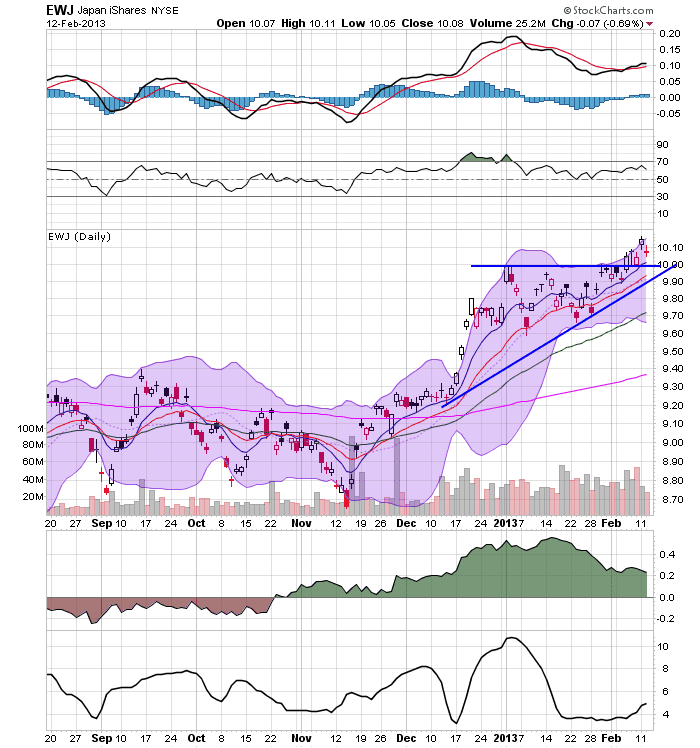 The lumber market is clearly benefitting from the turnaround in the housing market. 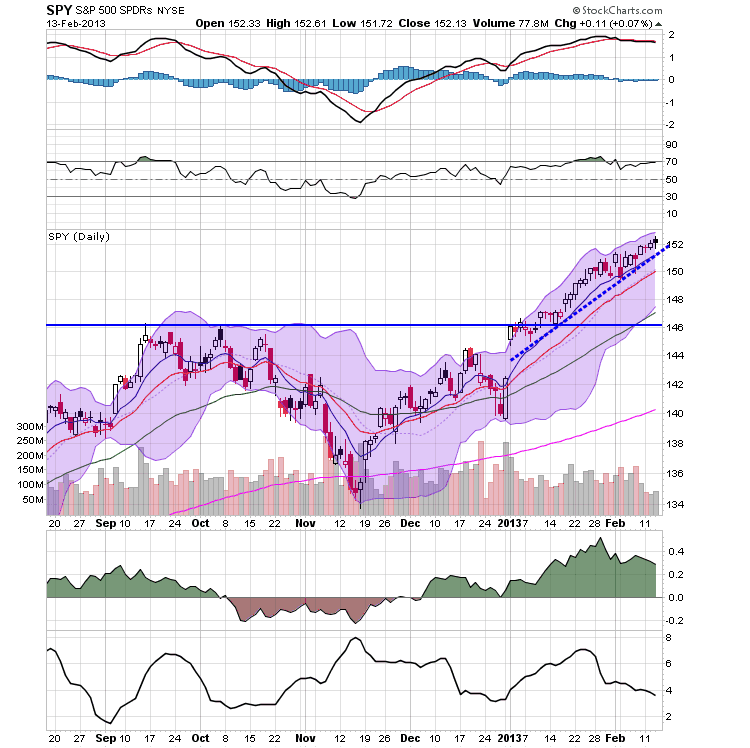 Prices were contained by the 320 level until late last fall when they rallied through that level. 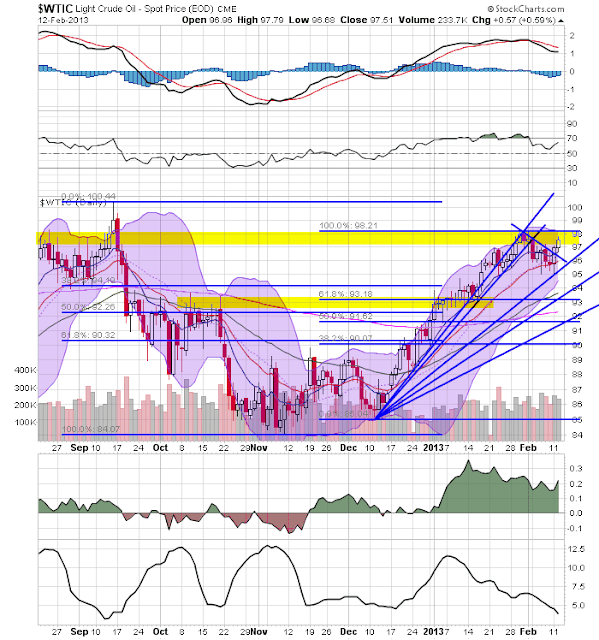 Prices next consolidated between the 320 and 340 level before breaking out at the beginning of December. 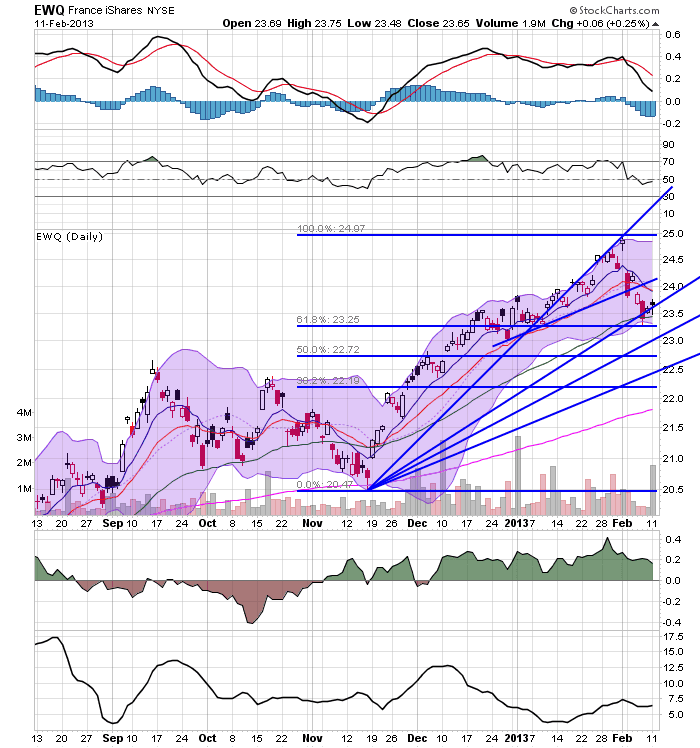 Prices rallied, retreated and then rallied again to the current level around 395. 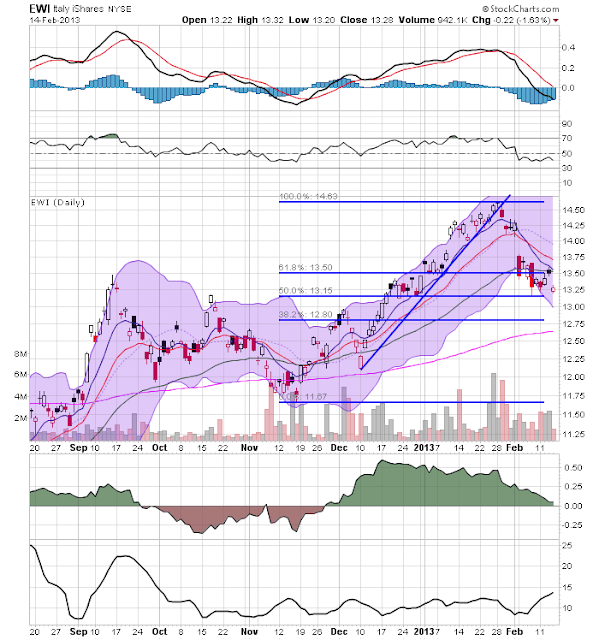 The long end of the yield curve is barely hanging on to technical support. The TLHs are right at the 131 level, while the TLTs are trading right at the 116 level. A meaningful break below either level would be bullish for the equity markets. The Russian market broke trend at the end of January and has been trading between the 30 and 31 level since. While momentum has decreased, the CMF reading indicates that money is flowing into the market. Also of importance is that prices didn't drop much below the 20 day EMA. 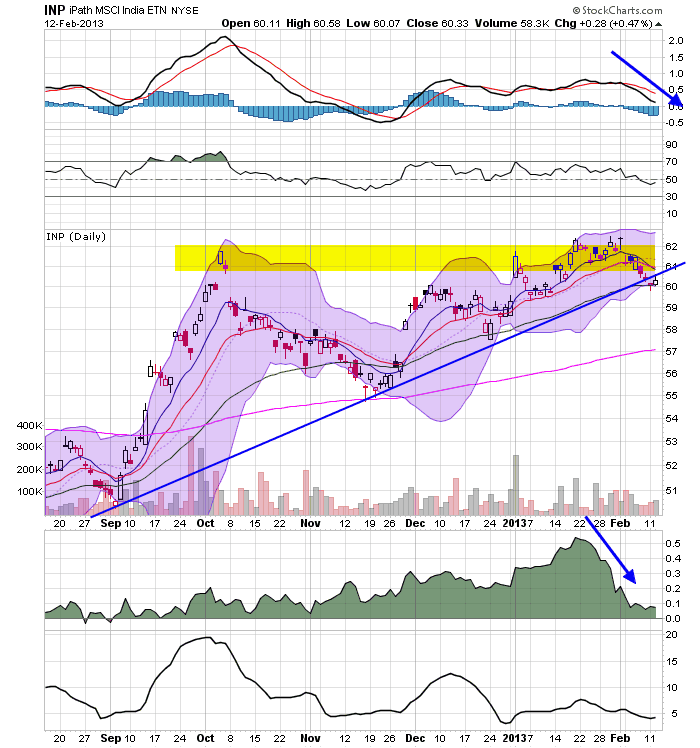 This tells us there's some price support right above 30. The Australian market broke an uptrend at the beginning of February and consolidated between the 26 and 26.5 levels. However, the technicals indicate a sell-off might be in order. The CF is declining and the MACD has given a sell signal. Is the Payroll Tax Increase Hitting Retail Sales? 2013 period were up 4.5 percent (±0.5%) from the same period a year ago. The November to December 2012 percent change was unrevised from +0.5 percent (±0.3%). 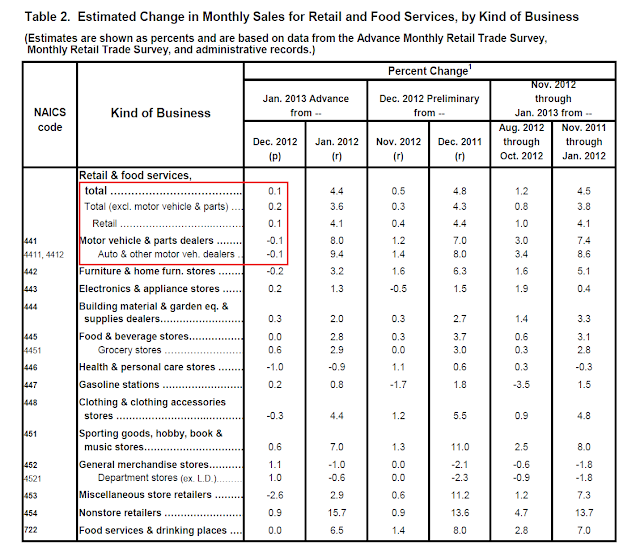 Retail trade sales were up 0.1 percent (±0.5%)* from December 2012 and 4.1 percent (±0.8%) above last year. Nonstore retailers were up 15.7 percent (±2.3%) from January 2012 and auto and other motor vehicle dealers were up 9.4 percent (±2.3%) from last year. Overall, we see weak retail sales growth in the nacro-data above. While the year over year numbers are good, the month to month is concerning. Some of the lack of increase could be the result of the Christmas season pulling into December, leading to a better Christmas with a bit of a January hangover. Also note the decrease in auto sales -- not at all encouraging. Note the bigger increases came from bread and butter retail: grocery stores increased .6%, GM increased 1.1%. Conversely, electronic stores only increased .2%, and furniture stores sales decreased .2%. In January we had the payroll tax increase start to bite. We could also be seeing the beginning effects of that development taking hold. The general reaction to this morning's retail sales report for January seems to be a sigh of relief, as the number was positive +0.1% month over month. In fact, real, inflation adjusted retail sales probably declined slightly, but we won't know for another week. Although the BLS does seasonally adjust the retail sales number, January CPI tends to be slightly higher than in most other months, running at an average of +0.3% over the last 10 years. If this year is in line with that average, then real retail sales will be down -0.2% for January. Typically the CPI report and the retail sales report are released within a day or two of each other, but this month we will have to wait until next Thursday for the CPI report. According to this report, on a YoY basis, consumer spending report has been on a tear since the beginning of December, reaching levels not seen since December 2008 - and staying there. While in 2012 consumer spending declined to a low of $59 on a 14 day rolling basis on February 7, 2012, this year it only fell as low as $74 on January 27. It has since increased back to $88 on February 11, $28 higher YoY for the previous 14 day period. It's been suggested that high income earners who got year end bonuses to beat the tax rate increases are out spending the money, and that certainly looks like a reasonable surmise. 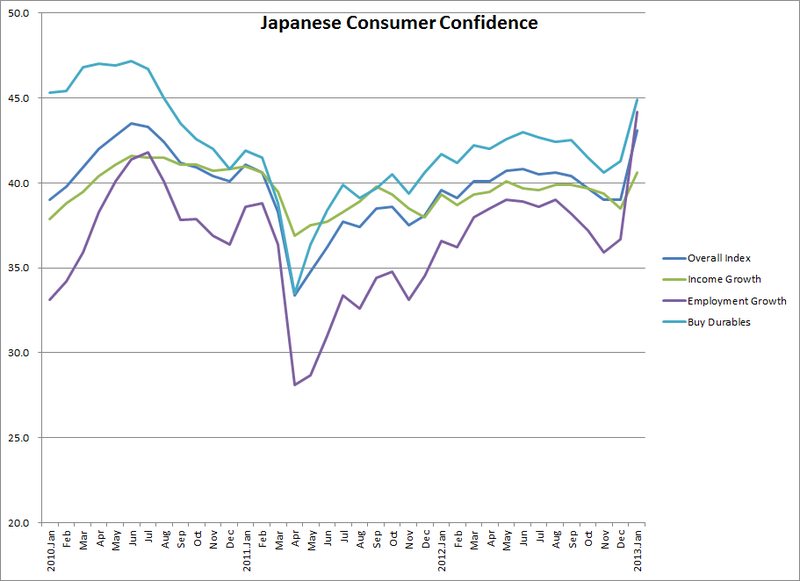 Japan consolidated from the beginning of the year to early February. Since then, prices have moved a bit higher, which has pulled the EMAs along for the ride. However, notice the light volume over the last two trading days and the weakening (though still positive) nature of the CMF. 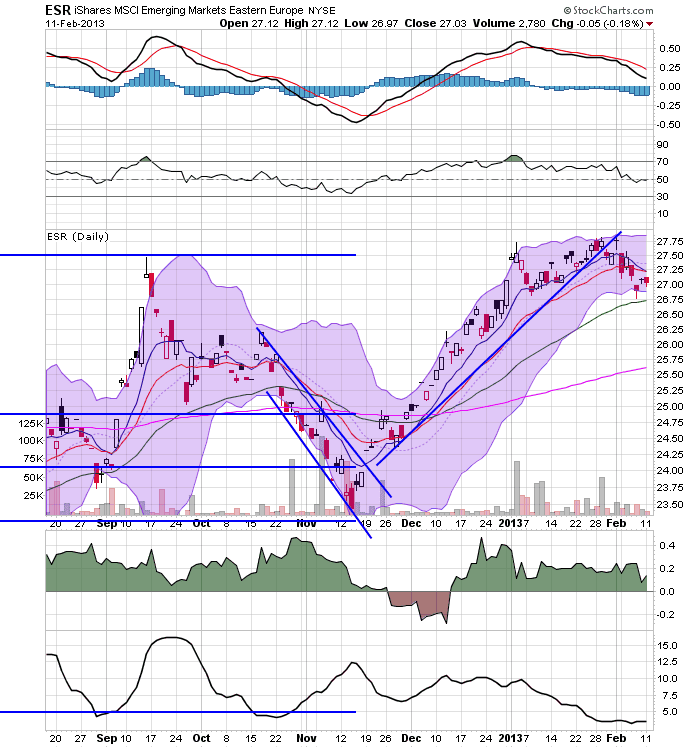 The overall chart is weakening a bit. The Indian market couldn't get above resistance at the 62 area, so has started to move lower. 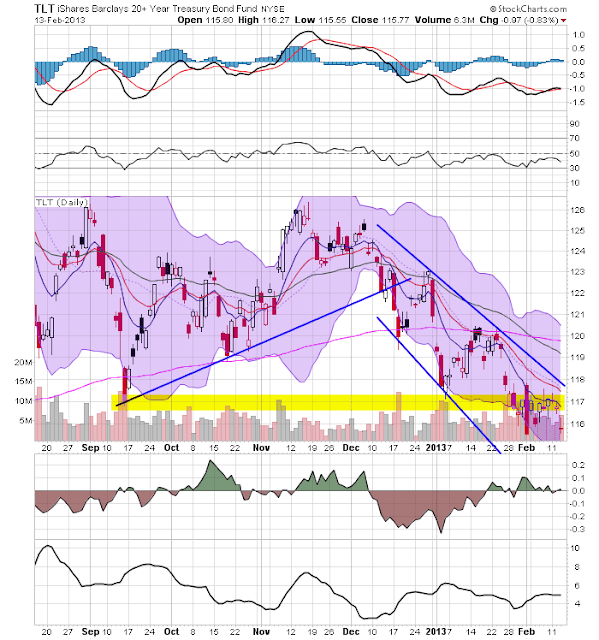 Prices are now below the trend line and are right at the 50 day EMA. Also note the weakening of the MACD and CMF. The Transports have spiked since the beginning of the year. 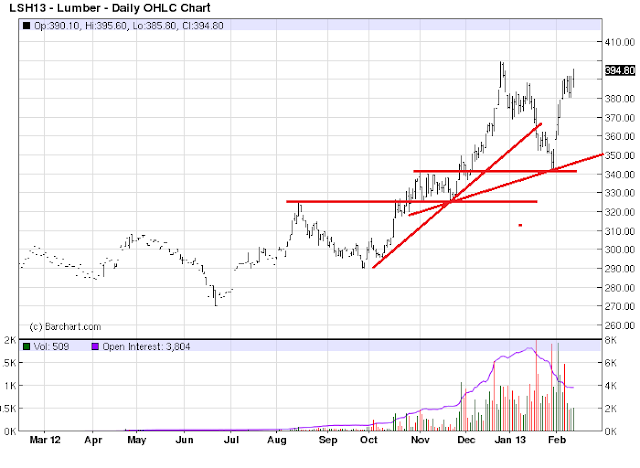 They rallied to near the end of the month in January, sold off a touch and then tried to continue moving higher. 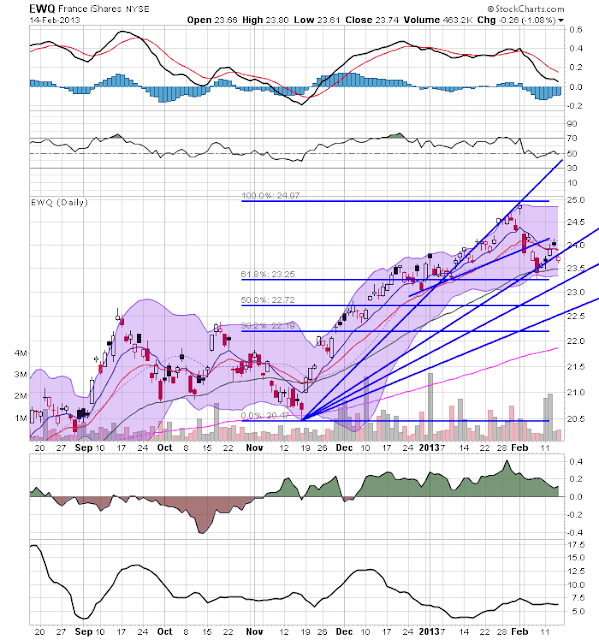 But note the smaller candles as the market has moved higher accompanied by a decrease in the MACD. Prices seem to have stalled right about the 105 handle. Finally, yesterday we see a big volume spike with no price follow-through. Oil broke trend at the beginning of February, moved lower to the 20 day EMA and has started to move higher over the last two trading sessions. 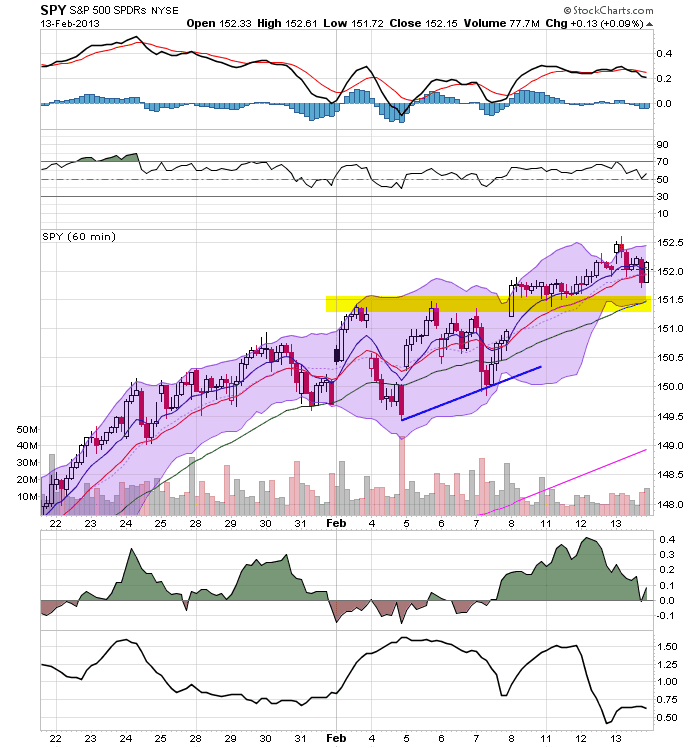 The 98 price level has a fair amount of resistance for the chart. Also note the weak MACD reading. 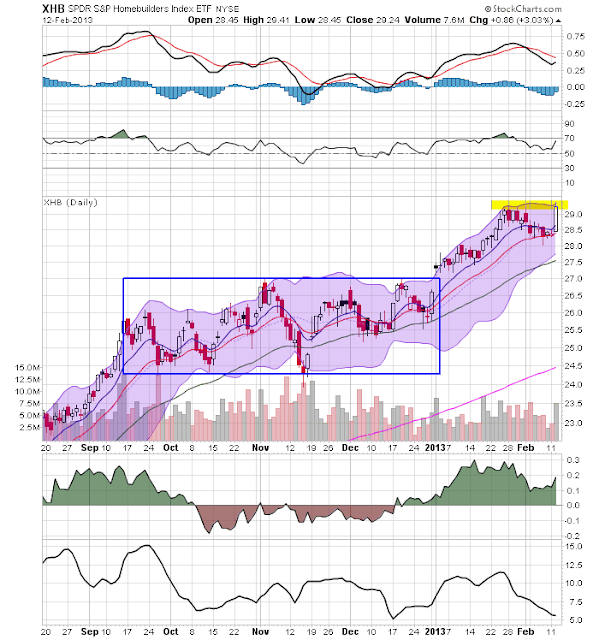 The housing ETF rose through January, sold-off in a disciplined manner at the end of January, but had a really big day yesterday, printing a massive bar on strong volume. The chart above shows big jumps since the new government started making waves. Whether it continues is anybody's guess at this point. 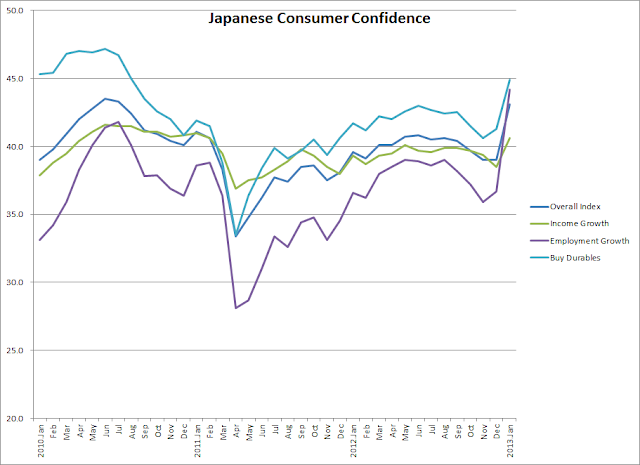 However, so far the government's moves are being seen positively by the Japanese population. Let me now explain our assessment in greater detail, starting with the economic analysis. 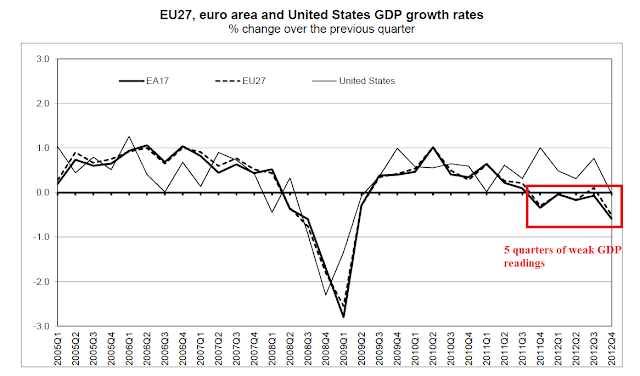 Euro area real GDP declined by 0.1%, quarter on quarter, in the third quarter of 2012, following a contraction of 0.2% in the second quarter. Available data continue to signal further weakness in activity in the fourth quarter and at the beginning of 2013. This weakness reflects the adverse impact of low consumer and investor sentiment on domestic expenditure, as well as subdued foreign demand. However, financial market sentiment has improved and the latest survey indicators confirm earlier evidence of a stabilisation in business and consumer confidence, albeit at low levels. Later in 2013 a gradual recovery should start, with domestic demand being supported by our accommodative monetary policy stance, the improvement in financial market confidence and reduced fragmentation, and export growth benefiting from a strengthening of global demand. It's standard issue for a central banker in the middle of a recession or slow economy to say that further down the road a gradual recovery will take place, largely as the effects of the central bank's policy announcement take hold. But, let's look at the overall data to see if that's what is really happening underneath the surface. That means that of 27 countries in the EU 27, a little under half are in a technical recession. A summation of the preceding points would be that the EU is just not doing that well. However, let's try and read the tea leaves of the four largest EU economies: Germany, France, Italy and Spain, starting with Germany. Germany is by far the largest economy in the EU area, accounting for about 27% of the EUs size. As such, it's performance alone can have a disproportionate impact on the EU's growth prospects. January data pointed to resurgent growth across the German service sector, with business activity and new order volumes both rising at the fastest rate since June 2011. Adjusted for seasonal influences, the final Markit Germany Services Business Activity Index picked up from 52.0 in December to 55.7 in January. 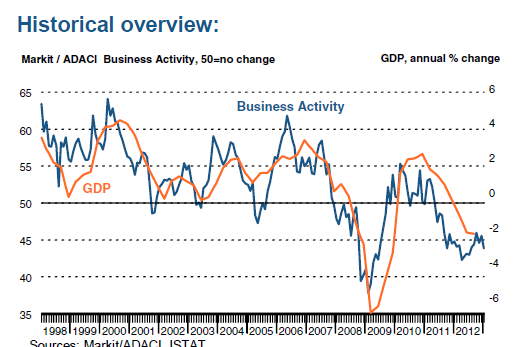 The index highlighted back-to-back monthly rises in business activity for the first time since May 2012. Moreover, the latest reading was well above its long-run average (52.9) and signalled a robust pace of output expansion that was the fastest for 19 months. The upturn in business activity at the start of 2013 reflected growth in five of the six sub-sectors monitored by the survey, with Post & Telecommunications the exception. 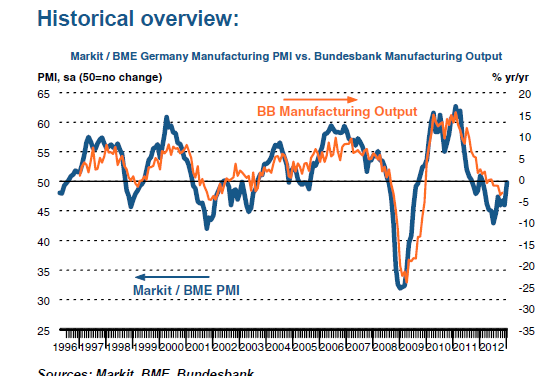 The Manufacturing chart (top chart) shows that this index has been negative for most of 2012. However it appears to have bottomed around mid-year and is currently rebounding higher, printing just below positive in their latest print. Overall production in the last report rebounded from a recent sharp decline, and exports -- while still being negative -- improved a bit. The real standout is the surge in the service PMI (bottom chart). This index went negative for the past part of 2012, but has since rebounded strongly. The latest report noted the primary reason for this surge was a big bump in new business, caused by improved customer confidence. This move was in contrast to the 8 months of new order decline that had occurred in 2012. First please click for a larger image. A few points stand out in the data. 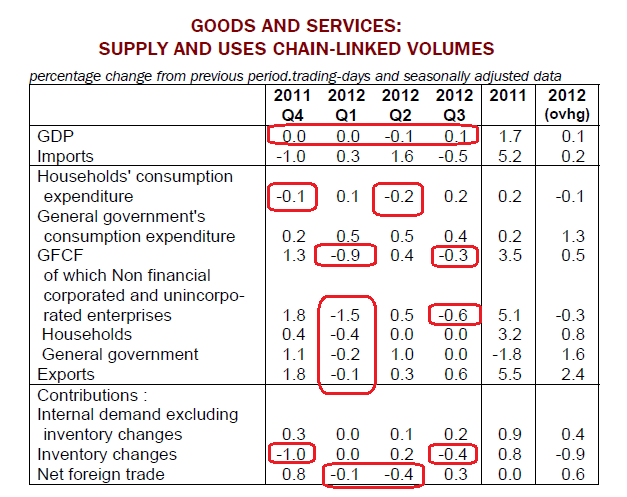 First, note the general rate of overall slowdown in the data. 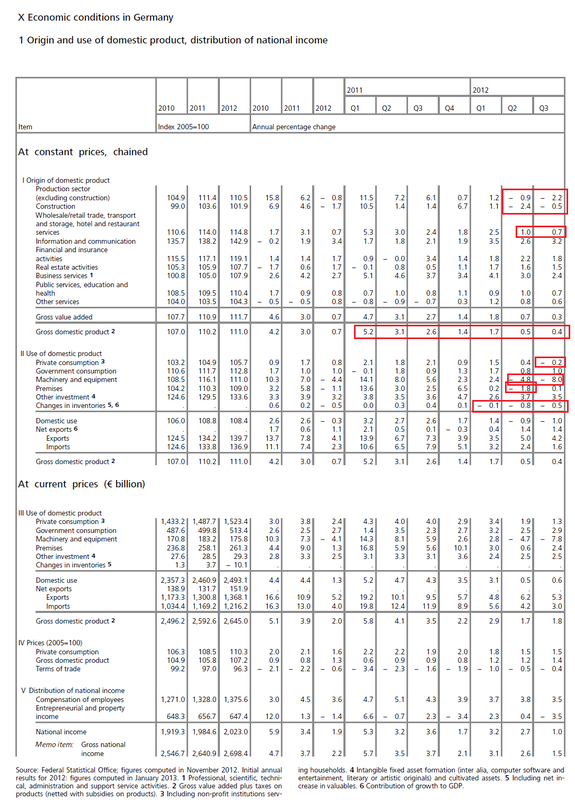 In the first few quarters of 2011 we see annual prints of 5.2% and 3.1%. By the last few quarters of last year, we're seeing prints of .5% and .4%. While these numbers are still positive, they are just barely so. The big reason for the slowdown is the drop in production and construction, which contracted in the last two quarters of last year. But also note the slowing of retail purchases and inventory depletion. The bottom line is several key components of the data slowed. 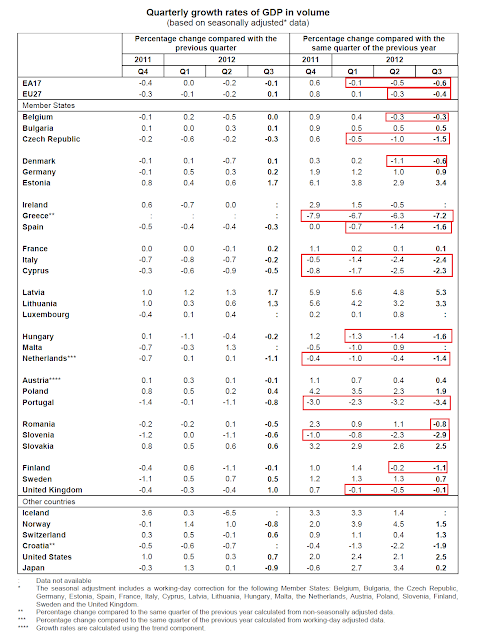 But also note the primary reason for the slowdown -- production -- is probably related to the overall slowing of the EU economy and Germany's export juggernaut. This means that a healing EU would lead to a growing Germany. Conclusion: Because of its size Germany has the ability to pull the EU out of its recent slow prints. The above data point to a brightening picture for this economy, but we're not out of the woods yet. Ideally, we'd need a new more months of strong manufacturing and service numbers. Morning Market Analysis: Europe Correcting. The above charts are all from Europe -- Spain (top chart), Italy (second from top), emerging Europe (middle chart), France (second from bottom) and Germany (bottom). 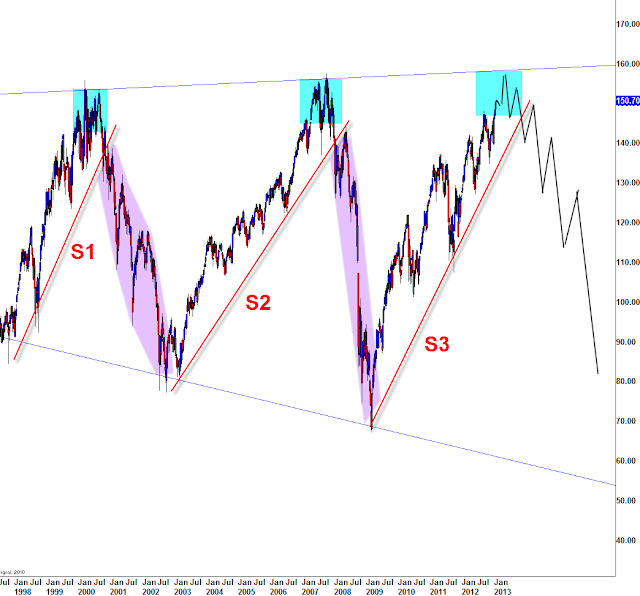 All have broken trend and are now correcting. All now have weaker MACDs. In all, the shorter EMAs (10 and 20) are declining and the 10 is below the 20 day EMA in two chart, with the other three close to printing the cross over. 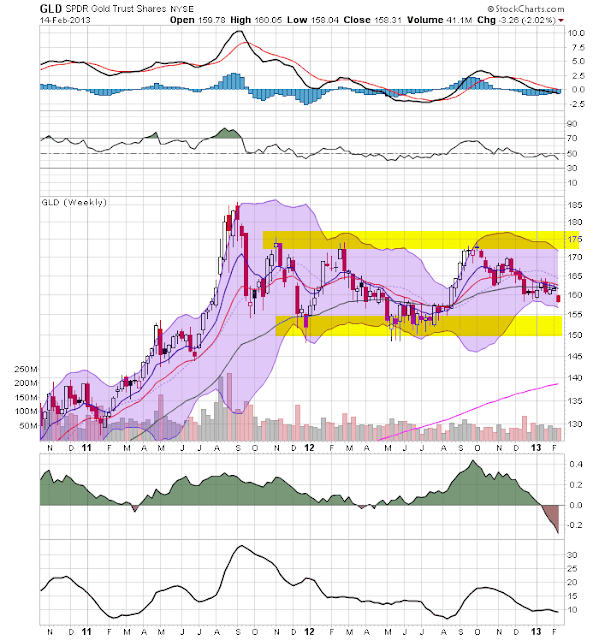 Prices are below the 10 and 20 day EMA in all charts. Also note the drop in the CMF in the Spanish and Italian markets (top two charts). Spain and Italy (top two charts) have already moved through the 61.8% Fib level and are working down to the 50%. 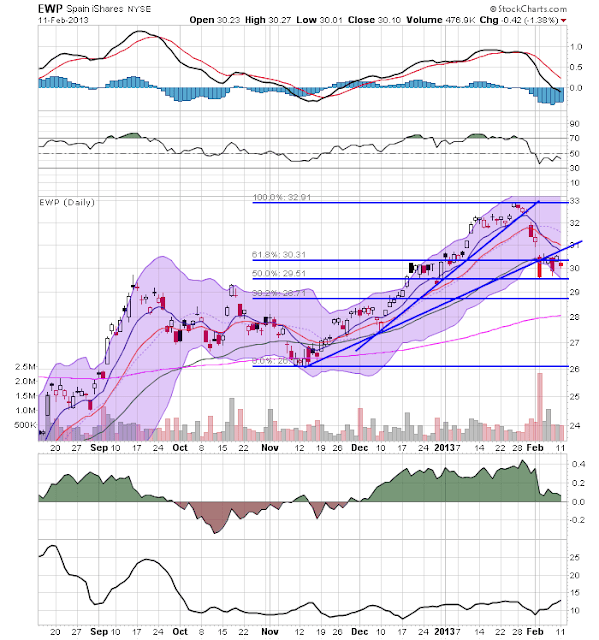 The French market (second from the bottom) is already at the top Fib fan and the German market (bottom) still has to make contact with a Fib level. So far, this has been an orderly correction. However, it's difficult to see the US market continuing higher at the same rate with European markets moving lower. All three economies have an inflation rate that is running hot on an annual percentage change basis. Russia's (top chart) dropped to a decent 3.6% in June of 2012. But since then it has been rising. While it appeared to plateau in he 6.5-6.6 area towards the end of last year, inflation edged higher in the latest report to 7.1%. Brazilian inflation (middle chart) bottomed at 4.92% in July of last year, but has since been moving consistently higher, currently sitting at 6.15%. It recently printed its highest level in 8 years. And India's inflation has been stubbornly sitting at just over 7% for the last year. All three countries are seeing a drop in the GDP growth rates. The problem each of these countries faces is that to encourage growth their respective central banks would lower interest rates. But their respectively high inflation rates make that a non-starter, forcing them ti either find other ways to encourage growth or to accept slower economic growth.